130130Activation of EasyDose is simple and fast. Visit the EasyDose website, select Store, select the Product and purchase the required License. 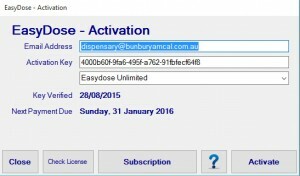 Your product key will be emailed to you directly in your invoice once payment has been received by EasyDose. The full features of EasyDose will be unlocked when you activate your product. 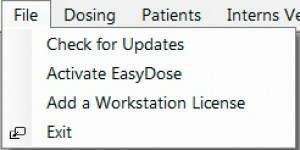 To activate EasyDose from the File menu, choose Activate EasyDose.